Popular ad blocker Adblock Plus claims that it was uninvited from the US Interactive Advertising Bureau’s big conference. 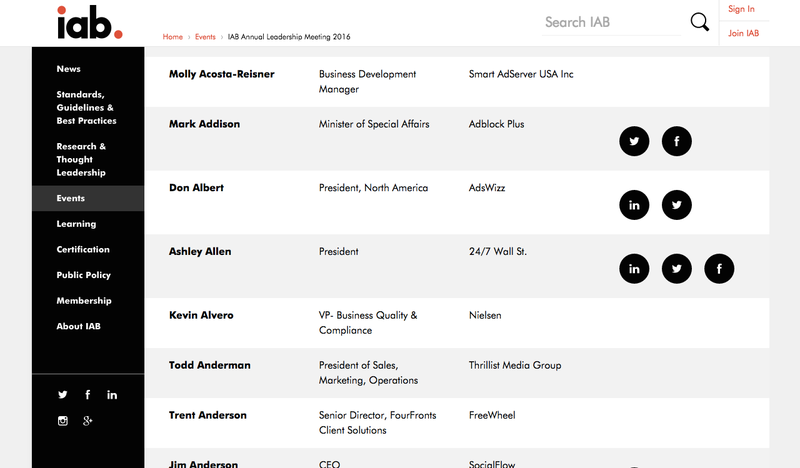 The IAB represents the biggest names in the digital-advertising industry: Google, Facebook, Twitter, online publishers, and ad-tech companies. Each year it holds its annual leadership meeting in Palm Desert, California. It’s where the biggest names in the online-advertising industry network and thrash out their ideas on the issues and trends of the day. This year they’ve got Oracle executive chairman Larry Ellison, Yahoo’s global revenue chief Lisa Utzschneider, and Google ads boss Sridhar Ramaswamy speaking. Adblock Plus won’t be attending, though. Last week, Adblock Plus received an email saying that the company’s registration fee was being returned and its registration had been canceled. Writing on the Adblock Plus blog, the company’s operations and marketing manager, Ben Williams, expressed his bafflement. Adblock Plus had paid its fee, had its place at the event confirmed, was even listed on the website as a participant — and attended the event last year! 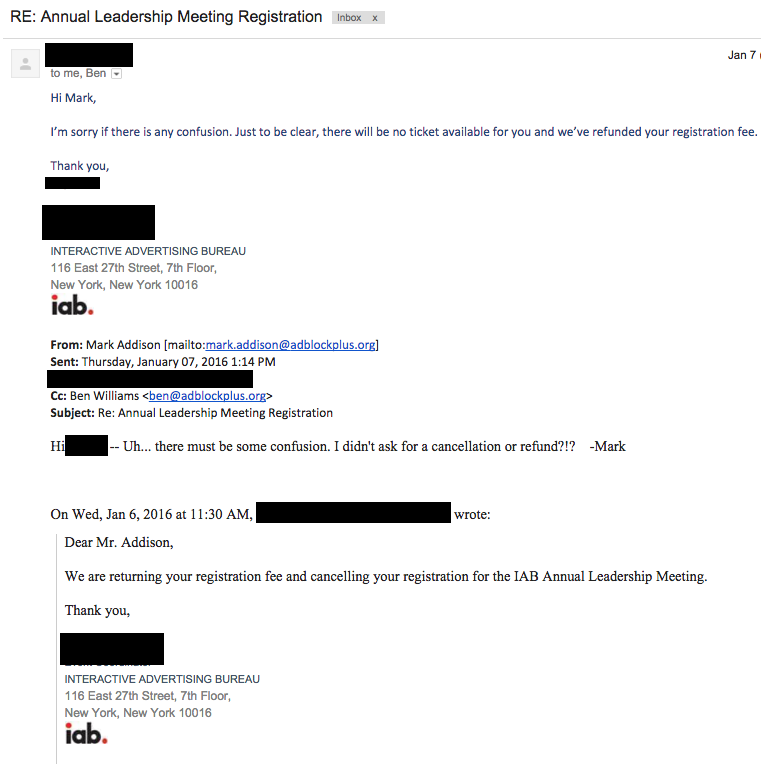 Williams said he has contacted the IAB’s CEO, Randall Rothenberg, but heard nothing back. Sadly, if the leader of the largest advertiser trade organization does not have the cojones to allow dis-senting voices to be heard, then he does so at his own peril. Ad industry pundits have blamed themselves for the meteoric rise of ad blocking, and some of IAB’s own lieutenants have called for Rothenberg’s resignation. We’re beginning to see why. In a notable (and noble) confession, one IAB executive even went on record saying “we messed up” by allowing online advertising to become overly aggressive, and thus helping to fuel ad blocker installs. The over 400,000,000 downloads of Adblock Plus are not going to “go away.” Dis-allowing Adblock Plus from attending your event solves nothing. We will proceed to work with others to build a sustainable monetization model for the Internet.